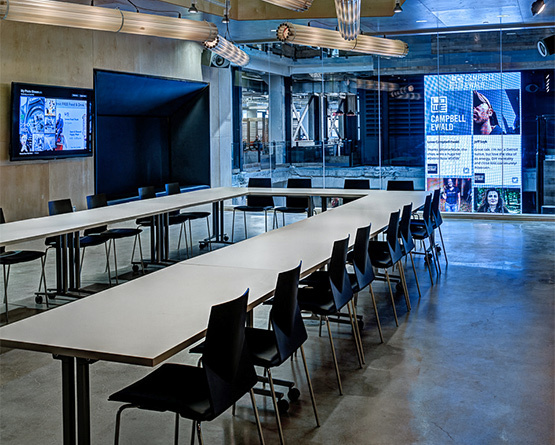 ABD Engineering and Design offers expert design consultation to transform conference rooms, boardrooms, and other meeting facilities with fully integrated solutions for audiovisual systems, control systems, and meeting room automation solutions. From simple AV solutions to complex control and room automation systems that seamlessly integrate and streamline AV, lighting, shades, room climate and more, we design scalable, flexible, cost-effective, audiovisual systems, controls and conference room automation solutions. That includes integration with BAS/BMS (Building Automation Systems/Building Management Systems), providing a straightforward interface for building owners and facilities managers to observe and adjust their building’s energy usage and operations. Our intuitive, user-friendly interface solutions balance the need for simplicity with that of flexibility. We design systems with a goal of minimizing the number of steps and options, identifying and eliminating those determined to be unnecessary. Often, we find ways to eliminate traditional control altogether, and allow users to engage with the room environment using their own devices and preferences. We understand the role audiovisual technology solutions play in enhancing communications, facilitating collaboration, and increasing productivity. We design scalable, future-proof conference room AV systems that efficiently upgrade as technology and applications evolve. We’re independent AV design consultants. We do not represent any particular brands, products, technologies or suppliers. We only work for you, offering objective, unbiased, cost-effective AV solutions for your conference rooms, boardrooms, and meeting spaces. We recommend and specify the appropriate technology, custom designed for each meeting space, and manage projects to verify proper installation, commissioning, and operation.